Khaleda Zia (IPA: kʰaled̪a dʒia; born Khaleda Khanam Putul   in 1945) is a Bangladeshi politician who served as the Prime Minister of Bangladesh from 1991 to 1996, and again from 2001 to 2006. She was the first woman in the country's history and second in the Muslim majority countries (after Benazir Bhutto) to head a democratic government as prime minister. 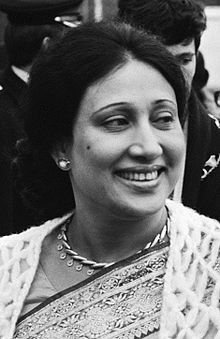 She was the First Lady of Bangladesh during the presidency of her husband Ziaur Rahman. She is the current chairperson and leader of the Bangladesh Nationalist Party (BNP) which was founded by Rahman in the late 1970s. After a military coup in 1982, led by Army Chief General H M Ershad, Zia helped lead the continuing movement for democracy until the fall of military dictator Ershad in 1990. She became prime minister following the victory of the BNP in the 1991 general election. She also served briefly in the short-lived government in 1996, when other parties had boycotted the first election. In the next round of general elections of 1996, the Awami League came to power. Her party came to power again in 2001. She has been elected to five separate parliamentary constituencies in the general elections of 1991, 1996 and 2001. In its list of the 100 Most Powerful Women in the World, Forbes magazine ranked Zia at number 14 in 2004, number 29 in 2005, and number 33 in 2006. 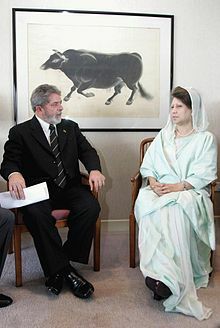 Following her government's term end in 2006, the scheduled January 2007 elections were delayed due to political violence and in-fighting, resulting in a bloodless military takeover of the caretaker government. During its interim rule, it charged Zia and her two sons with corruption. For the better part of the last two decades, Zia's chief rival has been Awami League leader Sheikh Hasina. The two women have alternated as non-interim prime ministers since 1991. In February 2018, Zia was jailed for five years for corruption. She was found guilty of embezzling the funds for an orphanage trust set up when she was prime minister. Zia was born to Iskandar Majumder, a businessman, and Taiyaba Majumder as Khaleda Khanam in Dinajpur District in Bengal, British India (now in north-western Bangladesh). To her family, she is known simply as "Putul". 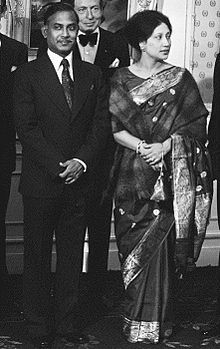 She married Ziaur Rahman in 1960, an army officer who became the 7th President of Bangladesh in 1977. He ruled until 1981, when he was assassinated in a military coup. When President Ziaur Rahman was killed, Justice Abdus Sattar became chairman of Bangladesh Nationalist Party and Zia the vice-chairman. When Sattar was ousted from the presidency by the military coup of 1982, Zia was elected chairperson. She thus became head of the BNP, which her husband had founded in the late 1970s. She was active in opposing what she and her supporters considered the military autocracy of Ershad during the 1980s. During the autocratic rule of Hussain Muhammad Ershad the Bangladesh Nationalist Party formed a seven-party alliance. Zia was detained more than seven times because of her protests against Ershad. A neutral caretaker government in Bangladesh oversaw elections on 27 February 1991 that were broadly considered[according to whom?] to be free, fair and truly democratic, following eight years of a military government. BNP won 140 seats, 11 short of a majority. As it was the only party capable of forming a government, Zia was sworn in as the country's first female prime minister on 20 March with the support of a majority of the deputies in parliament. The acting president Shahabuddin Ahmed granted Zia nearly all of the powers that were vested in the president at the time, effectively returning Bangladesh to a parliamentary system in September 1991. With a unanimous vote, the parliament passed the 12th amendment to the constitution in 1991. The BNP-led government formally restored the parliamentary system. When the opposition boycotted the 15 February 1996 election, the BNP had a landslide victory in the sixth Jatiya Sangshad. Other major parties demanded that a neutral caretaker government be appointed to oversee the elections. The short-lived parliament hastily introduced the Caretaker Government by passing the 13th amendment to the Constitution. The parliament was dissolved to pave the way for parliamentary elections within 90 days. In the 12 June 1996 elections, BNP lost to Sheikh Hasina's Awami League. Winning 116 seats, the BNP emerged as the largest opposition party in the country's parliamentary history. The BNP formed a four-party alliance on 6 January 1999 to increase its chances to return to power in the next general elections. These included its former political foe the Jatiya Party, founded by President Ershad after he led a military government, and the Islamic parties of Jamaat-e-Islami Bangladesh and the Islami Oikya Jot. It encouraged protests against the ruling Awami League. Many residents strongly criticized Zia and BNP for allying with Jamaat-e-Islami, which had opposed the independence of Bangladesh in 1971. The four-party alliance participated in the 1 October 2001 general elections, winning two-thirds of the seats in parliament and 46% of the vote (compared to the principal opposition party's 40%). Zia was sworn in as the Prime Minister of Bangladesh. She worked on a 100-day program to fulfill most of her election pledges to the nation. During this term, the share of domestic resources in economic development efforts grew. Bangladesh began to attract a higher level of international investment for development of the country's infrastructure, energy resources and businesses, including from the United States, Great Britain, and Japan. Restoration of law and order was an achievement during the period. Zia promoted neighbourly relations in her foreign policy. In her "look-east policy," she worked to bolster regional cooperation in South Asia and adherence to the UN Charter of Human Rights. She negotiated settlement of international disputes, and renounced the use of force in international relations. Bangladesh began to participate in United Nations international peacekeeping efforts. In 2006, Forbes magazine featured her administration in a major story praising her achievements. Her government worked to educate young girls (nearly 70% of Bangladeshi women were illiterate) and distribute food to the poor (half of Bangladesh's 135 million people live below the poverty line). Her government promoted strong GDP growth (5%) based on economic reforms and support of an entrepreneurial culture. When Zia became prime minister for the third time, the GDP growth rate of Bangladesh remained above 6 percent. The Bangladesh per capita national income rose to 482 dollars. Foreign exchange reserve of Bangladesh had crossed 3 billion dollars from the previous 1 billion dollars. The foreign direct investments of Bangladesh had risen to 2.5 billion dollars. The industrial sector of the GDP had exceeded 17 percent at the end of Zia's office. On 29 October 2006, Zia's term in office ended. In accordance with the constitution, a caretaker government would manage in the 90-day interim before general elections. On the eve of the last day, rioting broke out on the streets of central Dhaka due to uncertainty over who would become Chief Advisor (head of the Caretaker Government of Bangladesh). Under the constitution, the immediate past Chief Justice was to be appointed. But, Chief Justice Khondokar Mahmud Hasan (K M Hasan) declined the position. President Iajuddin Ahmed, as provided for in the constitution, assumed power as Chief Advisor on 29 October 2006. He tried to arrange elections and bring all political parties to the table during months of violence; 40 people were killed and hundreds injured in the first month after the government's resignation in November 2006. Mukhlesur Rahman Chowdhury, the Presidential Advisor, met with Zia and Sheikh Hasina, and other political parties to try to resolve issues and schedule elections. Negotiations continued against a backdrop of political bickering, protests and polarisation that threatened the economy. Officially on 26 December 2006, all political parties joined the planned 22 January 2007 elections. The Awami League pulled out at the last minute, and in January the military intervened to back the caretaker government for a longer interim period. It held power until holding general elections in December 2008. On 11 January 2007, Army Chief General Moeen U Ahmed, along with a group of military officers, intervened to stage a bloodless coup and impose a state of emergency. They compelled Dr. Iajuddin Ahmed to step down as Chief Advisor of the Caretaker Government of Bangladesh. He continued as the President of Bangladesh. Elections scheduled for 22 January were postponed. The new caretaker government was led by former Bangladesh Bank governor Dr. Fakhruddin Ahmed. In fighting against corruption, it filed charges against the leaders of both the major parties. Both parties had been widely accused of corruption when leading the government. In March 2007 Zia's eldest son, Tareque Rahman, was arrested for corruption. Enforcing the suppression of political activity under the state of emergency, from 9 April, the government barred politicians from visiting Zia's residence. Zia's youngest son, Arafat Rahman (Coco), was arrested for corruption on 16 April. United News Bangladesh (UNB) said in April there was speculation that Zia would relocate to Saudi Arabia. It noted her brother, Major (Retd.) Sayeed Iskandar, was trying to negotiate her exit from Bangladesh with the interim administration. The New Nation reported on 17 April that Zia had agreed to go into exile in return for the release of her youngest son. The report said the Saudi government had expressed its willingness to accept Zia and her family as royal guests. On 19 April, Khondker Babul Chowdhury, a member of the BNP national executive committee, filed an appeal urging the court to order the government not to send Zia abroad against her wishes, and challenging her reported confinement to her house. On 22 April the High Court issued a ruling for the government to explain or prove within five days that she was not confined to her house. On 25 April, in what was viewed as a reversal, the government said that Zia's movement was not restricted and that she had not been under any pressure to leave the country. On a related issue, it dropped the ban against the return of Hasina, who had been out of the country. On 7 May, the High Court ordered the government to explain continuing restrictions on Zia. On 17 July, the Anti Corruption Commission Bangladesh (ACC) sent notices to both Zia and Hasina, requesting that details of their assets be submitted to the commission within one week. Zia was asked to appear in court on 27 September 2007 in connection with a case for not submitting service returns for Daily Dinkal Publications Limited for years. On 2 September 2007, the interim government filed charges of corruption against Zia related to the awarding of contracts to Global Agro Trade Company in 2003; she was arrested 3 September. Her youngest son Arafat Rahman (Coco), along with 11 others, was also detained after police filed a corruption case against them involving irregularities at Chittagong port. A bribery case was filed against Sheikh Hasina, the head of the Awami League. She was detained separately in a special jail. On the same day, Zia expelled her party Secretary General Abdul Mannan Bhuiyan and Joint Secretary General Whip Ashraf Hossain for breaching party discipline. After Zia was detained, BNP standing committee members chose former Finance Minister Saifur Rahman and former Water Resources minister Major (Rtd.) Hafizuddin Ahmed to lead the BNP for the time being; Zia's supporters did not recognize this. Bangladesh Election Commission subsequently invited Hafizuddin's faction, rather than Zia's, to participate in talks, effectively recognizing the former as the legitimate BNP. Zia challenged this in court, but her appeal was rejected on 10 April 2008. Zia's youngest son Arafat Rahman was released in August 2007, and her eldest son Tareque Rahman was released on bail on 3 September 2007. Zia had been granted bail on two of her four cases by this point, but remained in jail because bail had not been granted for the other two. Her lawyers said on 4 September that they would also seek bail for the other two cases. Zia was released from jail on bail on 11 September 2008. On 30 September, Zia was granted bail by the High Court, which ruled that the trial should be stopped on the grounds that she could not be charged under emergency laws for actions that had occurred prior to the state of emergency being imposed in January 2007. The government appealed this decision. On 4 October 2007 the Bangladesh Supreme Court ruled that Zia should not be granted bail and that the trial could continue. In December 2008, the caretaker government organized general elections where the Awami League and its Grand Alliance (with 13 smaller parties) took a two-thirds majority of seats in the parliament. Sheikh Hasina became prime minister, and her party formed government in 2009. After several movements in a period of severe political unrest between 2012-2014 to prevent the ruling party to hold the 10th general election in January 2014 without a neutral care taker government, Zia led BNP and its alliances boycotted the election. Violence was reported in polling day including bombing of polling centers which Zia was accused of ordering. In 2016 BNP announced its new National Standing Committee, in which she retained her position as BNP Chairperson. In May 2017, she revealed BNP's vision 2030 to gain public support for the next general elections. However the ruling Awami League government denounced Vision 2030 as an act of plagiarism of Awami League's Vision 2021 which they used in the ninth general election, and claimed most of the targets in the Visions were fulfilled by Awami League, thus declaring BNP's Vision 2030 as unoriginal. This renewed tensions between BNP and Awami League. In 2017 the police conducted a raid on Zia's house as per government orders, which BNP heavily protested and claimed the government was carrying out autocratic actions. On 8 February 2018, Zia was sentenced to prison for five years in a corruption case for embezzlement of international funds donated to Zia Orphanage Trust, filed during the 2006–08 caretaker government. Her party claimed that the verdict was politically biased. Zia was sent to the Dhaka Central Jail after the verdict. She was not able to contest in the general election of 2018 because the constitution of Bangladesh prohibits a convicted person sentenced to over two years from participating. Her son Tarique Rahman was sentenced to life imprisonment over a deadly 2004 attack at a political rally held for Sheikh Hasina. Zia with US President Bill Clinton. General Ziaur Rehman and his family lived in a large house in the Dhaka Cantonment, which was first built as the residence of the Deputy Chief of Staff (DCS) of the Bangladesh Army. When Ziaur Rahman was appointed DCS Major General, he and his family moved there. After he became President of Bangladesh, he kept the house as his residence. Following his assassination in 1981, the Acting President Justice, Abdus Sattar, leased the house "for life" to Zia, for ৳101. When the Army took over the government, Lieutenant General Hussain Mohammad Ershad, Army Chief of Bangladesh and Chief Martial Law Administrator, confirmed this arrangement in 1982. After the BNP came to power in democratic elections in 1991, it did not disturb the arrangement. In November 2010, the Awami League government enforced existing law to reclaim the house where Zia had lived for nearly 40 years for a nominal cost. Zia moved to the house of her brother Sayeed Iskandar at Gulshan. Saudi Arabia: Zia made some high-profile foreign visits in the later part of 2012. Invited to Saudi Arabia in August by the royal family, she met with the Saudi crown prince and defence minister Salman bin Abdulaziz Al Saud to talk about bilateral ties. She tried to promote better access for Bangladeshi migrant workers to the Saudi labour market, which was in decline at the time. People's Republic of China: She went to People's Republic of China in October, at the invitation of the government. She met with Chinese leaders including Vice President Xi Jinping and the Communist Party of China's international affairs chief Wang Jiarui. Xi became China's Paramount Leader in 2012. Talks in China related to trade and prospective Chinese investment in Bangladesh, particularly the issue of financing Padma Bridge. At the beginning of 2012, the World Bank, a major prospective financier, had withdrawn, accusing government ministers of graft. The BNP announced that the Chinese funding for a second Padma Bridge was confirmed during her visit. India: On 28 October 2012, Zia visited India to meet with President Pranab Mukherjee, Prime Minister Manmohan Singh and a number of officials including foreign minister Salman Khurshid, national security adviser Shivshankar Menon, foreign secretary Ranjan Mathai and BJP leader and leader of opposition Sushma Swaraj. Talks were scheduled to cover bilateral trade and regional security. Zia's India visit was considered notable as BNP had been considered to have been anti-India compared to its rival Awami League. At her meeting with Prime Minister Singh, Zia said her party wanted to work with India for mutual benefit, including the fight against extremism. Indian officials announced they had come to agreement with her to pursue a common geopolitical doctrine in the greater region to discourage terrorists. Zia claims 15 August as her birthday, which is a matter of controversy in Bangladesh politics. 15 August is the day many immediate family members of Zia's political rival, Sheikh Hasina, including her father Sheikh Mujibur Rahman were killed. As a result of the deaths, 15 August is officially declared National Mourning Day of Bangladesh. None of Zia's government issued identification documents show her birthday on 15 August. Her matriculation examination certificate lists a birth date of 9 August 1945. Her marriage certificate lists 5 September 1945. Zia's passport indicates a birth date of 19 August 1945. Kader Siddiqui, a political ally of Zia, urged her not to celebrate her birthday on 15 August. The High Court filed a petition against Zia on this issue. On 24 May 2011, the New Jersey State Senate honored Zia as a "Fighter for Democracy". It was the first time the state Senate had so honoured any foreign leader and reflects the state's increasing population of immigrants and descendants from South Asia. ^ a b c Islam, Sirajul (2012). "Zia, Begum Khaleda". In Islam, Sirajul; Ahmed, Helal. Banglapedia: National Encyclopedia of Bangladesh (Second ed.). Asiatic Society of Bangladesh. ^ "#14: Begum Khaleda Zia, Prime Minister of Bangladesh". Forbes 100 Most Powerful Women in the World. 2004. Archived from the original on 14 June 2012. Retrieved 4 February 2014. ^ "#29 Khaleda Zia, Prime minister, Bangladesh". The 100 Most Powerful Women. Forbes.com. 2005. Retrieved 4 February 2014. ^ "#33 Khaleda Zia, Prime Minister, Bangladesh". The 100 Most Powerful Women. 31 August 2006. Retrieved 4 February 2014. ^ a b "Bangladesh ex-PM son detained". Al Jazeera. 16 April 2007. ^ a b "Ex-PM sued on corruption charges in Bangladesh". International Herald Tribune. Associated Press. 2 September 2007. Archived from the original on 12 February 2009. ^ a b Anis Ahmed (3 September 2007). "Bangladesh ex-PM Khaleda Zia arrested on graft charge". Reuters. Retrieved 4 February 2014. ^ Skard, Torild (2014). "Khaleda Zia". Women of Power - Half a century of female presidents and prime ministers worldwide. Bristol: Policy Press. ISBN 978-1-44731-578-0. ^ a b "Clashes as Bangladesh ex-PM jailed". BBC News. 2018-02-08. Retrieved 2018-06-14. ^ "Khaleda Zia". Encyclopædia Britannica. ^ "Bogra: Khaleda Zia". bogra.org. Retrieved 25 February 2015. ^ Super User. "Bangladesh National Party - BNP - Begum Khaleda Zia". bnpbangladesh.com. Archived from the original on 5 February 2015. Retrieved 25 February 2015. ^ a b Dieter Nohlen; Florian Grotz; Christof Hartmann (2001). Elections in Asia: A data handbook. Volume I. p. 537. ISBN 0-19-924958-X. ^ a b Dieter Nohlen; Florian Grotz; Christof Hartmann (2001). Elections in Asia: A data handbook. Volume I. p. 525. ISBN 0-19-924958-X. ^ Alastair Lawson (4 October 2001). "Analysis: Challenges ahead for Bangladesh". BBC News. ^ "Analysis: Challenges ahead for Bangladesh". BBC News. Retrieved 25 February 2015. ^ "Violence Breaks out in Bangladesh's Capital Dhaka". China News and Report. Xinhua News Agency. 17 October 2006. Retrieved 28 November 2015. ^ "Renewed violence hits Bangladesh". BBC News. 28 October 2006. Retrieved 28 November 2015. ^ Roy, Pinaki (28 October 2006). "Hasan 'unwilling' to be caretaker chief". The Daily Star. Retrieved 28 November 2015. ^ "KM Hasan steps aside for the sake of people". The Daily Star. 29 October 2006. Retrieved 28 November 2015. ^ Habib, Haroon (30 October 2006). "President takes over in Bangladesh". The Hindu. Retrieved 28 November 2015. ^ Rahman, Waliur (8 January 2007). "Is Bangladesh heading towards disaster?". BBC News. Retrieved 11 January 2007. ^ "Iajuddin wants to open talks with alliances". The Daily Star. 30 November 2006. Retrieved 4 February 2014. ^ "Politicians barred from visiting Khaleda Zia's residence". The Hindu. 11 April 2007. Retrieved 4 February 2014. ^ "Khaleda agrees to leave for exile: Arafat sent back to Cantonment residence". The New Nation. 17 April 2007. Archived from the original on 10 November 2007. ^ "Opposition welcomes B'desh U-turn". BBC News. 26 April 2007. Retrieved 4 February 2014. ^ "Bangladesh High Court orders government to explain restrictions on ex-prime minister". International Herald Tribune. Associated Press. 8 May 2007. Archived from the original on 1 June 2008. ^ "Hasina, Khaleda given 7 days for wealth report". The Daily Star. 18 July 2007. p. 1. Retrieved 4 February 2014. ^ "Khaleda asked to appear before court September 27". The Daily Star. 27 August 2007. ^ "Ex-PM is arrested in Bangladesh". BBC News. 3 September 2007. Retrieved 3 September 2007. ^ "Khaleda Zia expels BNP Secretary General Abdul Mannan Bhuiyan", ANI (andhranews.net), 4 September 2007. ^ "Bangladesh court rejects Zia appeal". Al Jazeera. 10 April 2008. ^ "Former Bangladesh PM Zia's lawyers say will lobby for her release". AFP. 4 September 2008. Archived from the original on 4 October 2012. Retrieved 4 February 2014. ^ a b c "Ex-Bangladesh PM Zia denied bail". BBC News. 4 October 2007. Retrieved 4 February 2014. ^ "BNP's names 17 members of the policymaking Standing Committee". bdnews24.com. ^ "BNP names members of its leaders' families in new committee". bdnews24.com. ^ "Vision 2030: Bangladesh Nationalist Party – BNP" (PDF). Prothom Alo. ^ "Bangladesh Police Raid Khaleda Zia's Office". News18. ^ "Bangladesh former Prime Minister guilty of corruption". The Independent. Retrieved 2018-06-14. ^ Star Online Report (8 February 2018). "Khaleda Zia enters old central jail". The Daily Star. Retrieved 8 February 2018. ^ Mahmud, Faisal (8 February 2018). "Khaleda Zia jailed for five years in corruption case". Aljazeera. Retrieved 2018-02-08. ^ World Digest (October 11, 2018). "Bangladesh sentences 19 to death in 2004 rally attack". Washington Post. ^ a b "Khaleda Zia Evicted from her Residence in Dhaka". Rediff. 13 November 2010. Retrieved 4 February 2014. ^ a b "Khaleda going to Saudi Arabia". BDnews24. 7 August 2012. Archived from the original on 22 August 2012. Retrieved 29 October 2012. ^ a b "CPC, Bangladesh Nationalist Party to further cooperation". Xinhua. 18 October 2012. Retrieved 29 October 2012. ^ "Khaleda seeks China's help". The Daily Star. 21 October 2012. Retrieved 29 October 2012. ^ "Stalled Padma Bridge Project". Daily Sun. 20 September 2012. Retrieved 29 October 2012. ^ "Chinese help for 2nd Padma bridge assured: BNP". The New Nation. 23 October 2012. Archived from the original on 18 October 2015. Retrieved 29 October 2012 – via HighBeam Research. (Subscription required (help)). ^ "China ready to help build 2nd Padma bridge: BNP". News Today. 23 October 2012. Archived from the original on 31 December 2012. Retrieved 29 October 2012. ^ "Khaleda Zia arrives in the capital, meets Sushma". Deccan Herald. 28 October 2012. Retrieved 29 October 2012. ^ "India and Bangladesh Embraceable you". The Economist. 30 July 2011. Retrieved 29 October 2012. Mrs Zia's family dynasty ... is as against India as Sheikh Hasina's is for it. ^ "Khaleda Zia assures counter-terror cooperation to India". Yahoo News. Indo Asian News Service. 29 October 2012. Retrieved 29 October 2012. ^ ভারতবিরোধী কর্মকাণ্ডে বাংলাদেশের মাটি ব্যবহার করতে দেওয়া হবে না: খালেদা জিয়া [Khaleda Zia: No anti-India activity would be allowed to use the soil of Bangladesh]. BBC Bangla (in Bengali). 29 October 2012. Retrieved 29 October 2012. ^ a b "15 August isn't Khaleda's birthday: Joy". Natun Barta. 15 August 2013. Retrieved 17 August 2013. ^ a b "Stop celebrating August 15 birthday". The Daily Star. 24 July 2011. Retrieved 17 August 2013. ^ a b c "Ex-Bangladesh PM stretches limits of political rivalry with PM Sheikh Hasina by celebrating birthday on August 15". Yahoo News-1. 16 August 2013. Retrieved 17 August 2013. ^ "Same old trend". The Daily Star. 17 August 2013. Retrieved 17 August 2013. ^ a b "Huge cakes are cut on Khaleda Zia's 'birthday'". bdnews24.com. 15 August 2013. Retrieved 17 August 2013. ^ "HC hears petition on Khaleda's birthday tomorrow". The Daily Sun. 13 June 2013. Retrieved 17 August 2013. ^ "Notice to ex-Bangladeshi PM for celebrating b'dday on August 15". Zee News. 15 August 2013. Retrieved 17 August 2013. ^ "New Jersey Senate honours Khaleda". The Daily Star. 25 May 2011. ^ "BNP goes gaga over US honour". 27 May 2011. p. 1. Retrieved 4 February 2014. "Life Sketch: Begum Khaleda Zia". Permanent Mission of Bangladesh to the United Nations. Archived from the original on 13 January 2009. Barbara Crossette (17 October 1993). "Conversations: Khaleda Zia; A Woman Leader for a Land That Defies Islamic Stereotypes". The New York Times. William Green; Alex Perry (10 April 2006). "'We Have Arrested So Many'". Time. Alex Perry (3 April 2006). "Rebuilding Bangladesh". Time. Archived from the original on 30 November 2010. "Tearful Khaleda reaches Gulshan office". bdnews24. Archived from the original on 5 March 2012. Rakib Hasnet Suman; Hasan Jahid Tusher (14 November 2010). "I am evicted". The Daily Star. "খালেদা জিয়ার বাড়ী নিয়ে লড়াইয়ের ১০ বছর" [Khaleda Zia's house fighting 10 years]. Amar Desh (in Bengali). 14 November 2010. Archived from the original on 6 October 2011. This page was last edited on 17 April 2019, at 14:56 (UTC).